BEFORE: After a canceled class, two group project meetings, a class that wasn’t canceled, and editing two segments for a TV show (oh, and don’t forget Wheel of Fortune and Jeopardy! ), it’s finally time for my film of the day, The Hangover Part II. I found the first film to be quite funny but it seemed like a one-trick film. Based on what I’ve heard of Part II that appears to be true but I’ll be seeing for myself. AFTER: Sure enough, the Wolf Pack is back in pretty much the same story as The Hangover except it’s based in Thailand instead of Vegas. Much of the appeal to the first film was it’s somewhat original (I’m sure similar ideas had been done before that) premise and execution. Here’s this group of guys who have such a wild night at the bachelor party the night before the wedding which leads to problems on the wedding day. Great idea and one that’s ripe with laughs but the obstacle for Part II is how can it still remain fresh and original? The answer: it doesn’t. It literally is the same film with different locales and objects substituted here and there. 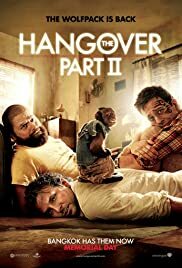 For example, instead of the baby (and/or lion) from the first film there is a monkey, the Wolf Pack was drugged yet again (although not ruffies), and Stu (Ed Helms) hooks up with another prostitute just to name a few similarities. The basic outline also remains the same from the first film starting with the panicked call in the beginning, then the pre-trip setup, followed by the piecing together of the blacked-out bits. So The Hangover Part II doesn’t surpass that obstacle but is it still funny? Surprisingly enough, it found myself laughing quite a bit. Most of the humor came in the pre-trip setup before they even get to Thailand. This time is actually spent referencing the first film with Stu emphatically stating he does not want a wild bachelor party this time in fear of a repeat of the disaster. Character-wise, the funniest person has to be Alan (Zach Galifianakis) followed by Phil (Bradley Cooper). After the blackout, I still laughed occasionally but much of the humor was lost because it was recycled material from the first film. Overall, The Hangover Part II was a decent comedy. If you liked the first one, you’ll probably enjoy Part II. Even though it’s the exact same plot, it doesn’t take away all of the humor and you’ll still find yourself chuckling now and then. If you didn’t like the original, you probably won’t like Part II because again, it’s pretty much the same film. Based on this track, things don’t look that great for The Hangover Part III, currently scheduled for release on May 24, 2013. But things may change and the filmmakers could go an entirely different route. I’ll probably watch it anyway because I’ve already seen these first two.